Sky Zhou, also know as Matrix Inception on YouTube, is no stranger here on NextReality. We loved his Pokémon concept game for HoloLens, as well as his D3D Keyboard that lets HoloLens users leave notes around the house. He just can't seem to stop creating cool mixed reality apps, and he's already got another one in the works. My experience has taught me that it is no easy feat to capture a series of pictures, then stitch and map them together to a large polygon mesh, but it looks like a piece of cake in Zhou's latest video. He takes pictures of his living room with his HoloLens camera (not seen in video), creates a spatial map of the room, and then puts the pictures in their correct places to make a pretty accurate recreation of the space. All of this while running at a realistic frames-per-second on the HoloLens. A similar process has been tried before with the Hololens_Image_Based_Texture project. I tried the first version of it myself, and memory and frame rate problems made it barely usable. Still, it is cool in concept, but Zhou seems to have it beat. 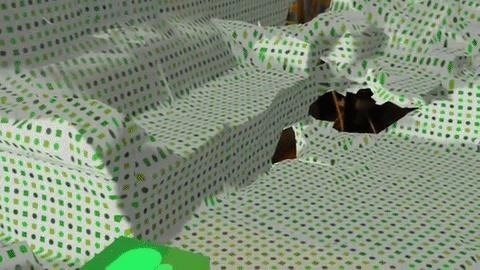 After first showing his local spatial map with a simple green and white texture, a simple voice command causes the room textures to appear. He then scales the spatial map down to what he calls a miniMap, which includes an animated person in the scene to represent his location and orientation in the room. It should not be too long now until we can pull up a 3D map of our local space — that actually looks like our space — complete with the locations of our holograms and applications. At this point, we can quickly and easily move things around without having to go to that specific area to move it. It would also be beneficial to share a miniMap with others, so they can help you redecorate, for example. And gaming comes to mind, too. How about an asymmetrical game type that has a bunch of people running around the spatial map and one person with a miniMap laying out traps and bombs to catch the players in? Asymmetrical has not really taken off in the gaming world. Could mixed reality be the key to making that work? What uses do you see for this kind of miniMap in the future of mixed reality? Let us know in the comments below.